The Northern cardinal, a familiar backyard bird in many sections of the United States, is a perfect symbol of the Christmas season. The shopping days before Christmas are getting fewer, so I hope everyone has had time to find gifts for everyone on their lists. My wish to readers is that everyone gets to enjoy a great holiday that just might also include watching some birds. Often, when we think of the birds of the winter season, our thoughts focus on some of the less-than-colorful feeder visitors — the brown sparrows and wrens, the black and white chickadees and the drab American goldfinches, so unlike their summer appearance. Photo by Skeeze/Pixabay.com • A male Northern cardinal lands on a snowy perch. 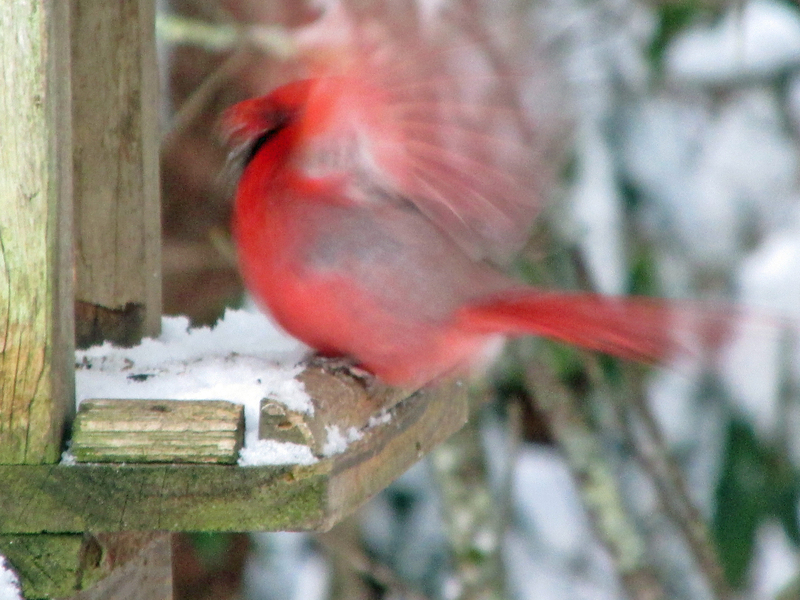 Cardinals are perfect symbols for the Christmas season with their bright red plumage. There’s one bird, however, that makes an impression in any season. The Northern cardinal, especially the brilliant red male, stands out against a winter backdrop of snow white, deep green or drab gray. 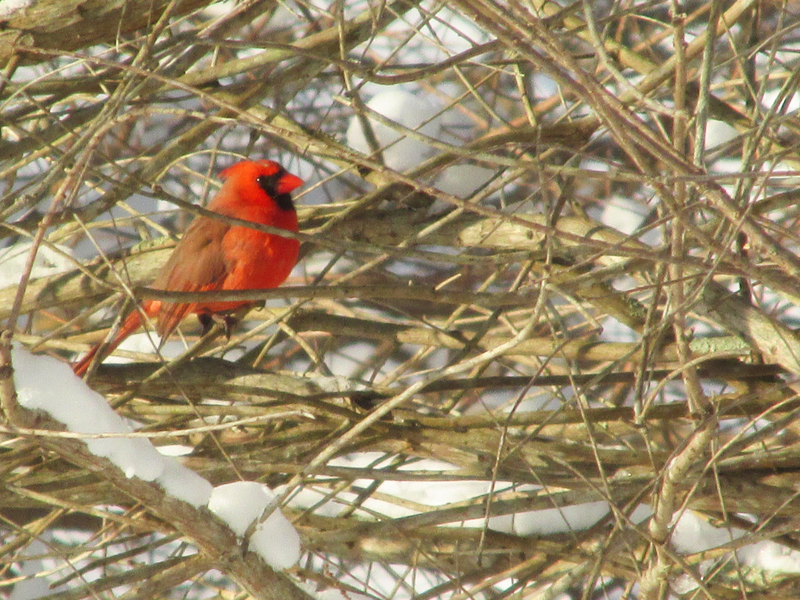 On a recent snowy afternoon, I spent some time watching a pair of Northern cardinals from my window. Cardinals are wary birds. They make cautious approaches to feeders, never rushing to the seed in the manner of a Carolina chickadee or tufted titmouse. The Northern cardinal belongs to a genus of birds known as Cardinalis in the family Cardinalidae. There are only two other species in this genus, and they range across North America and into northern South America. The two relatives are the pyrrhuloxia, or Cardinalis sinuatus, a bird of the southwestern United States, and the Vermilion Cardinal, or phoeniceus, a bird found in Colombia and Venezuela. Photo by U.S. Fish & Wildlife Service • The Pyrrhuloxia, or desert cardinal, is a counterpart to the Northern cardinal in the American southwest. Photo by Pixabay.com • A red-crested cardinal forages on a sandy beach. This bird has been introduced to such exotic locations as Hawaii. Photo by Skeeze/Pixabay.com • A female Northern cardinal lands on a deck railing. Female cardinals are not as brightly colorful as males, but they do have their own subtle beauty. Photo by Ken Thomas Even the female Northern Cardinal offers observers admirable, subtle beauty. The familiar Northern Cardinal is not the only bird to bear the name cardinal. Others include the yellow cardinal of Argentina, Brazil, Paraguay and Uruguay, the vermilion cardinal of Colombia and Venezuela, and the red-crested cardinal, a songbird native of South America that has also been introduced to Puerto Rico and Hawaii. Photo by Bryan Stevens • Northern cardinals will visit feeders stocked with sunflower seeds at any season. At feeders, cardinals mingle with a variety of other birds. Cardinals are common visitors to backyard feeders. For such a bright bird, the male cardinal can be surprisingly difficult to detect as he hides in the thick brush that conceals his presence. Cardinals are nervous birds, however, and usually betray their presence with easily recognized chip notes. Their preference for dense, tangled habitat is one they share with such birds as brown thrashers, Eastern towhees, Carolina wrens and song sparrows. In general, however, cardinals directly associate only with their own kind. Cardinals will form loose flocks during the winter, but these flocks are never as cohesive as those of such flocking birds as American goldfinches. Cardinals are more often observed in pairs. Photo by Bryan Stevens • Northern cardinals are a favorite for makers of Christmas ornaments. 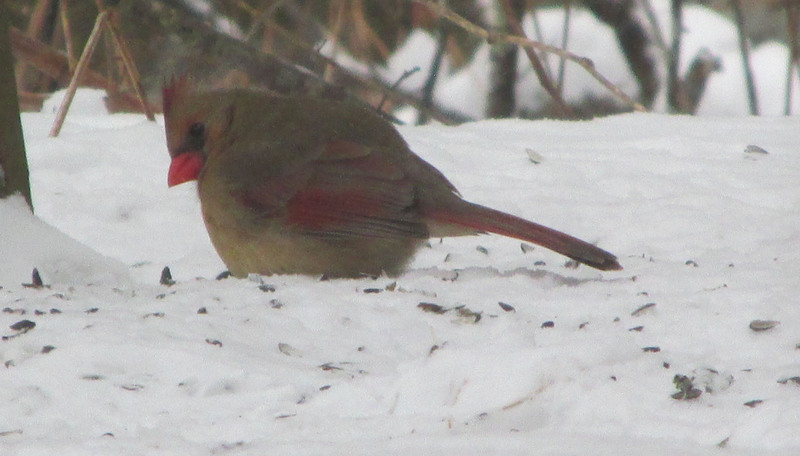 Even once the holidays are past, there’s nothing like a glimpse of a Northern cardinal to add some cheer to a bleak winter day. Simply add some black oil sunflower seeds to your feeders to welcome this beautiful bird to your yard. Photo by Bryan Stevens • A male Northern cardinal visits a feeder on a snowy afternoon. This entry was posted in Abingdon, Bird calendars, Bird Christmas gift ideas, Birding, Birds, Bristol, Bristol Herald Courier, Brookgreen Gardens, Bryan Stevens, Bryan Stevens Feathered Friends, Cardinal, Cardinalis cardinalis, Christmas Bird Count, Christmas traditions, Common Birds of Northeast Tennessee, Elizabethton Star, Erwin Record, Johnson City Press, Jonesborough Herald and Tribube, Kingsport Times, McDowell News, North Carolina, Northern cardinal, Uncategorized, Winter birds and tagged Autumn, Blogs, Bristol Herald Courier, Bryan Stevens, Cardinalis cardinalis, Cardinals, Christmas, Christmas cards, Christmas customs, Elizabethton Star, Erwin Record, Feathered Friends, greeneville sun, Johnson City Press, Jonesborough Herald and Tribune, Kingsport Times, Kingsport Times-News, McDowell News, nature, Northern Cardinal, The Erwin Record, Virginia, winter on December 23, 2018 by Bryan Stevens. I took part in a Christmas Bird Count last month. These annual mid-December surveys of bird populations are not quite as exciting as counts held during the spring or fall migration periods each year, but they can produce some interesting results. One exciting post-count activity after taking part in a CBC is getting together to compile the results tallied by the various participating groups and individuals. The results are usually compiled on field checklists for birds of Tennessee. These checklists, which are produced by the Tennessee Wildlife Resources Agency and the Tennessee Ornithological Society, feature a listing of the common name of every bird species likely to be encountered in the state. Photo by USFWS/Robert Burton • An American kestrel in flight shows the aerodynamic design that earned this small falcon the common name of sparrow hawk. The compiler generally reads out the various names on the checklist, which lists all the local birds, beginning with black-bellied whistling duck and ending with house sparrow, and the spokespersons for the various parties respond as each bird’s name is called with the number of birds seen for each species. Over the years, some of the common names of birds featured on the list have changed, as has the position on the list for some of the species. For instance, the American kestrel and other falcons are no longer listed on the card in a grouping with the other raptors found in the state. This doesn’t make much sense to me. But, as I understand it, the falcons have been re-classified for scientific reasons, changing their relationship with the other birds listed on the checklists. The falcons are not the only birds demoted from the grouping of raptors. The two native vultures — turkey vulture and black vulture — are now listed with herons and ibises instead of raptors. The falcons are now listed between the groupings of woodpeckers and flycatchers. Photo by Bryan Stevens • Former common name rufous-sided towhee became Eastern towhee, which is far less descriptive of the bird’s appearance. At least no expert has suggested a name change for any of the falcons. I dislike name changes, especially when we lose a descriptive name for a mundane one. That’s how we got relatively bland names like Eastern towhee instead of rufous-sided towhee and Northern flicker in place of yellow-shafted flicker. In fact, the American kestrel was once known as the sparrow hawk. The merlin and peregrine falcon, larger relatives of the kestrel, were once known as the pigeon hawk and duck hawk, respectively. Common names are also known as “vernacular” names. Vernacular can be defined as the language or dialect spoken by the ordinary people, which contrasts with the scientific names for species of birds that are usually only recognized by ornithologists or other experts. However, just like dialects, there can be a great deal of variety among common names for the same birds. Many of the common names for some of our favorite birds lack any vivid descriptiveness. Photo by Bryan Stevens • Northern cardinal seems much less descriptive of this popular bird than such common names as Virginia nightingale and cardinal grosbeak. For instance, let’s take a look at the Northern cardinal, which has been known by such common names as cardinal bird, cardinal grosbeak, crested redbird, Kentucky cardinal, redbird, Virginia redbird and Virginia nightingale. The first thing that irritates me about the common name of this bird is that there is no Southern cardinal. So, why is this bird the “Northern” cardinal? The only other birds in the Cardinalis genus are the desert cardinal, also known as the pyrrhuloxia, and the vermilion cardinal. Both these relatives have arguably more interesting and descriptive names than their relative, which is a favorite of many birders and arguably better known to many people. I can understand why Kentucky cardinal and Virginia redbird are not inclusive names since the Northern cardinal ranges far beyond the borders of these two states. On the other hand, cardinal grosbeak with its reference to the cardinal’s large beak, as well as crested redbird, are both more descriptive and creative than the rather nondescript Northern cardinal. I think The Bard was on to something. Whether we call a cardinal a redbird or a Virginia nightingale, it’s song will sound as sweet to our ears. 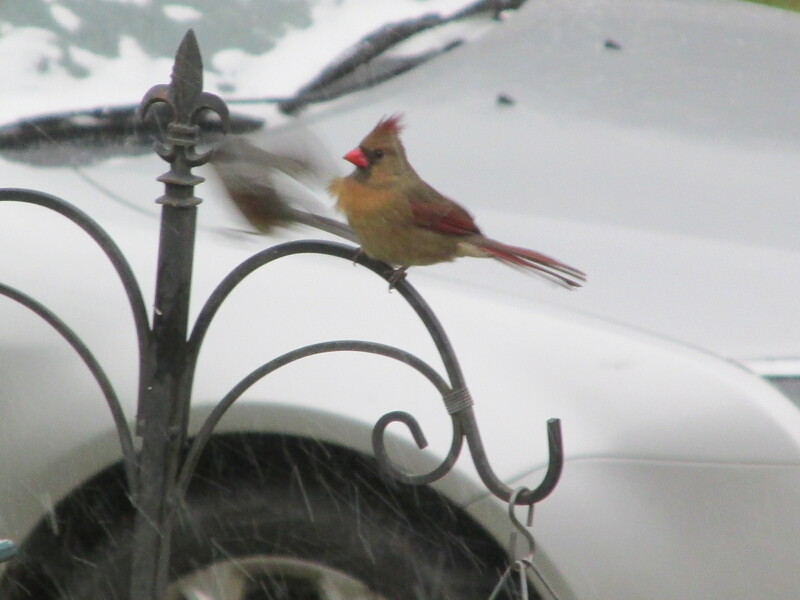 The appearance of one of these birds on a gloomy day will elevate our mood whether we know the bird as cardinal grosbeak, Kentucky cardinal or, in scientific terminology, Cardinalis cardinalis. As promised, here’s an update on the hummingbirds that proved dutiful daily visitors to a sugar water feeder at the Bristol home of Ralph Beamer through Halloween, Thanksgiving and Christmas. Early in the new year, Ralph notified me that the hummingbirds departed ahead of 2018’s arrival. Ralph noted that he had a wonderful time watching them for the past three months. He is hopeful they will come back in the future, but figured that is probably wishful thinking. Actually, some of these winter hummingbirds, which often turn out to be rufous hummingbirds, have proven quite faithful to favorite locations. Bird banders have recaptured some individual hummingbirds year after year in the same yards. During the stay of his visitors, Ralph shared photographs and videos with me of their visits to his feeders. I enjoyed receiving his periodic updates about them. I emailed Ralph back and told him that these hummingbirds seem to also have a knack for knowing when to leave and suggested he keep an eye out for them again next fall. This entry was posted in American goldfinch, Birding, Birds, Birds and bad weather, Bristol, Bristol Herald Courier, Bryan Stevens, Bryan Stevens Feathered Friends, Cardinal, Cardinalis cardinalis, Carter County Compass, Common Birds of Northeast Tennessee, Elizabethton Star, Emory and Henry College, Erwin Record, Johnson City Press, Jonesborough Herald and Tribube, Kingsport Times, McDowell News, Migration, nature, Northern cardinal, Our Fine Feathered Friends, Uncategorized, Winter birds, Winter hummingbirds and tagged American kestrel, Bristol Herald Courier, Cardinalis cardinalis, Cardinals, Eastern Towhee, Elizabethton Star, Erwin Record, greeneville sun, Johnson City Press, Jonesborough Herald and Tribune, Kingsport Times-News, McDowell News, nature, Northern Cardinal, Virginia, winter, Winter weather on January 21, 2018 by Bryan Stevens. Although many articles have been penned about the demise of the Christmas card, I still receive plenty of these paper greetings each holiday season. My friends and acquaintances, knowing me well, I suppose, often select cards featuring a variety of birds. Regardless of rising postal costs and hectic schedules during a busy season, the Christmas card appears to be an enduring tradition. Photo by Nathan Rathbun/USFWS • An observation of a bright red male Northern cardinal is sure to put some cheer into the holidays. Many of the cards I have received this year and in past holiday seasons have featured the Northern cardinal, which has long been one of my favorite birds. During the winter months, particularly during the holiday season, the Northern cardinal seems to take on even more significance. Anyone who received many Christmas cards this year will probably confirm that the cardinal often appears on them. The origins of the cardinal’s affiliation with the holiday of Christmas are a bit murky. After all, the Northern cardinal is a North American bird that would have been unknown in Europe until the 1600s, when the first explorers and settlers arrived from Europe. Photo by Jeff Keller/National Science Foundation • Chinstrap penguins (Pygoscelis antarctica) are also known as the bearded penguin and the ringed penguin. They reach about two feet tall and weigh less than 10 pounds. Chinstraps form strong bonds with their mates and will wait long periods for their mates to return to the breeding ground each year, rather than take a new mate. The cardinal is hardly the only species of wildlife, let alone bird, that has become closely associated with the holiday. Everything from polar bears and seals to doves and penguins are also popular motifs for designers who craft Christmas cards. In recent years, I’ve even seen other birds — owls, chickadees, and even sandpipers — begin to decorate cards. Often, when we think of the birds of the winter season, our thoughts focus on some of the less-than-colorful feeder visitors — the brown sparrows and wrens, the black and white chickadees and the drab American goldfinches that are such a contrast in winter to their vibrant summer appearance. The Northern Cardinal, especially the brilliant red male, stands out against a winter backdrop of snow white, deep green or drab gray. Could there be a better bird to brighten a Christmas card? Well, as it turns out, there are other birds beyond the picture-perfect Northern cardinal that are worthy of gracing the front of Christmas cards. As previously mentioned, penguins are popular featured birds on many a Christmas card. Thanks to major motion pictures like Happy Feet (2006) and Mr. Popper’s Penguins (2011), as well as documentaries like 2005’s March of the Penguins, these dapper birds have enjoyed an enhanced profile in recent years and earned a place on our Christmas cards. Photo by Kelly Falkner/National Science Foundation • Two emperor penguins greet each other near Ross Island in Antarctica. Emperors are the largest of all penguins, reaching nearly four feet tall. Of course, there’s not one single “penguin” species. There are about 20 different penguin species, ranging in size from the emperor penguin, which weighs 75 pounds and stands three feet seven inches tall, to the little blue penguin, also whimsically known as the fairy penguin, which weighs 2.2 pounds and stands about 16 inches tall. Other species include the king penguin, yellow-eyed penguin and macaroni penguin. While at first glance owls are an unlikely species for depiction on a Christmas card, I can understand why people have embraced these nocturnal birds. With their big eyes and a reputation that has improved as we are less likely to embrace superstitious myths, owls are a good choice for gracing the cover of a card. One species — the snowy owl — is a perfect bird to depict the wintry season. With its white plumage, contrasted with varying amounts of black or brown markings on the body and wings, this owl of the Far North is a good symbol for the Christmas season. It’s no surprise at all to find an image of a snowy owl staring with piercing yellow eyes from the front of a Christmas card. Other species of owls that I’ve seen featured on cards include barn owl, great horned owl, Northern saw-whet owl, and burrowing owl. In real life, the snowy owl is a denizen of the treeless tundra regions of the Arctic. Some winters see these owls staging massive migrations that bring them south of the Canadian border. While they are more likely to spend the winter months in such Canada-bordering states as Minnesota, Michigan and Wisconsin, snowy owls have surprised and delighted birders by winging their way as far south as Tennessee, Virginia and North Carolina during some winters. Photo by Tom Koerner/USFWS • This snowy owl was photographed at Sand Lake National Wildlife Refuge in South Dakota. Some winters see great numbers of this owl surge out of the tundra to winter south of the Canadian border. While owls and penguins are definite contenders, I’d wager that the Northern cardinal is the bird most often depicted on Christmas and other greeting cards. As further evidence to explain the popularity of the Northern cardinal, consider that it’s the official state bird of seven states — Virginia, North Carolina, West Virginia, Ohio, Illinois, Indiana, and Kentucky. Only the Northern mockingbird, which represents five states as official state bird, even comes close to the Northern Cardinal in this respect. Being designated an official state bird is also an honor that’s eluded any species of owl, let alone any of the world’s various penguins. Snowy owl pair painted by John James Audubon. Finally, one last thing works in favor of the Northern cardinal. Once the holidays are past, and the Christmas cards are packed away, there’s nothing like a glimpse of a Northern Cardinal to add some cheer to a bleak winter day. Photo by Mike Lucibella/National Science Foundation • An adult Adelie penguin turns its head. The Cape Crozier penguin colony is one of the largest known Adelie penguin colonies in the world, home to roughly half a million birds. 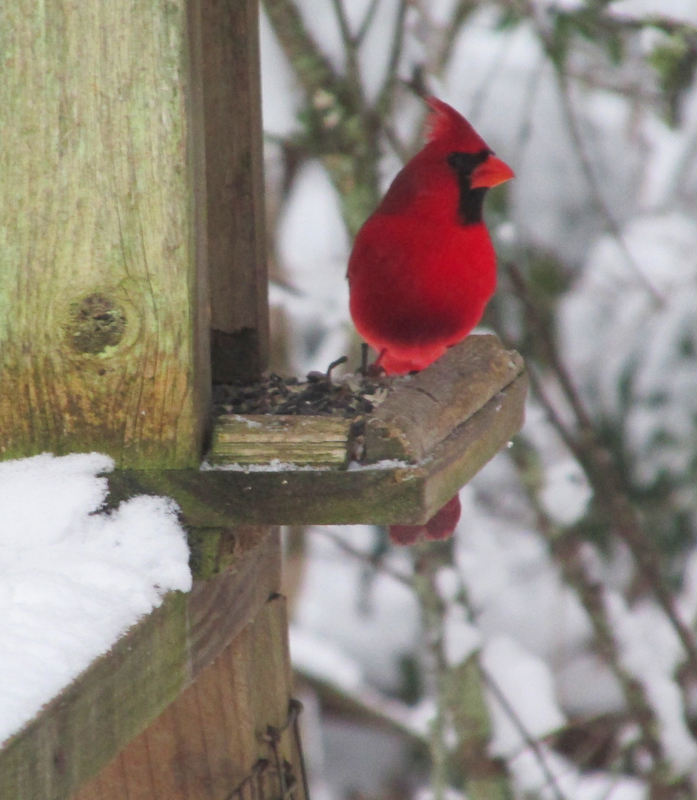 This entry was posted in Bristol Herald Courier, Bryan Stevens, Bryan Stevens Feathered Friends, Cardinal, Cardinalis cardinalis, Elizabethton Star, emperor penguin, Erwin Record, Johnson City Press, Jonesborough Herald and Tribube, Kingsport Times, McDowell News, Northern cardinal, penguin, penguins, Snowy Owl, Uncategorized and tagged Bristol Herald Courier, Bryan Stevens, Cardinalis cardinalis, Cardinals, Christmas, Christmas cards, Elizabethton Star, emperor penguin, Erwin Record, Feathered Friends, Johnson City Press, Jonesborough Herald and Tribune, McDowell News, nature, Northern Cardinal, Our Fine Feathered Friends, Owls, penguin, penguins, Snowy Owl, Virginia on December 31, 2017 by Bryan Stevens. Photos by Bryan Stevens A female Northern Cardinal visits a feeder during a snowstorm. A male cardinal investigates a feeder. A male cardinal stays concealed within a thicket. 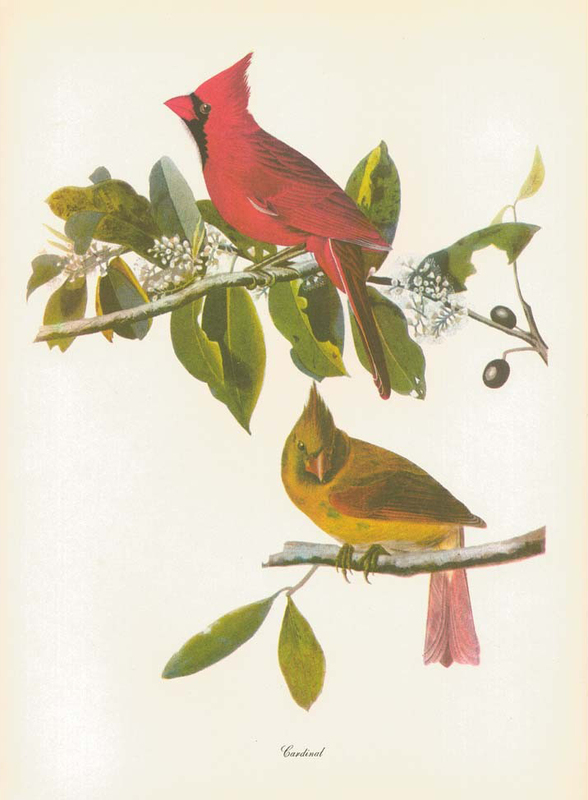 Early naturalist and artist John James Audubon painted the Northern Cardinal. A flash of red signal a visit from a male Northern cardinal. There’s no difficult in identifying a cardinal. The male boasts crimson plumage, a crest, a black face and orange bill. The female, although less colorful, is also crested. Female cardinals are soft brown in color, with varying degrees of a reddish tinge in their feathers, particularly in their wings. Immature cardinals resemble females except young cardinals have dark bills. 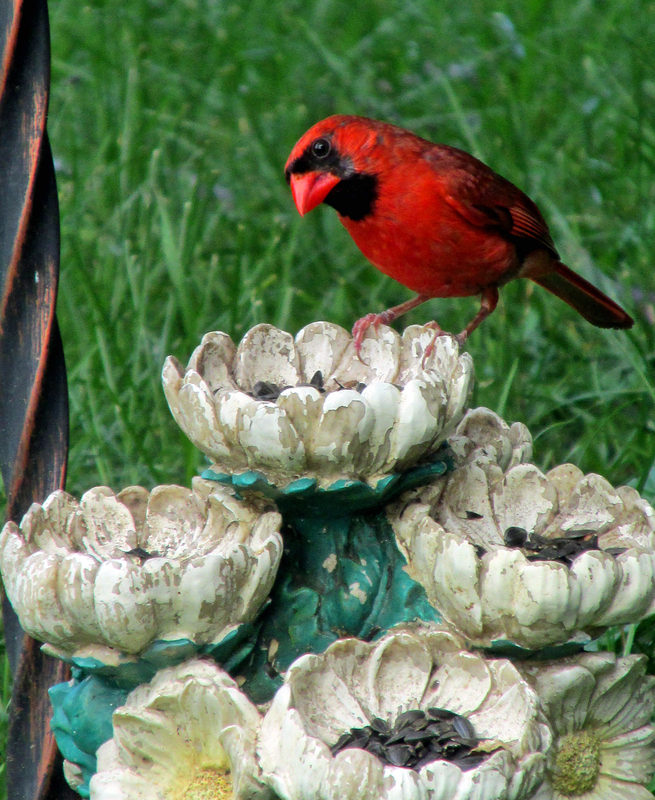 A male Northern cardinal perches on a feeder. 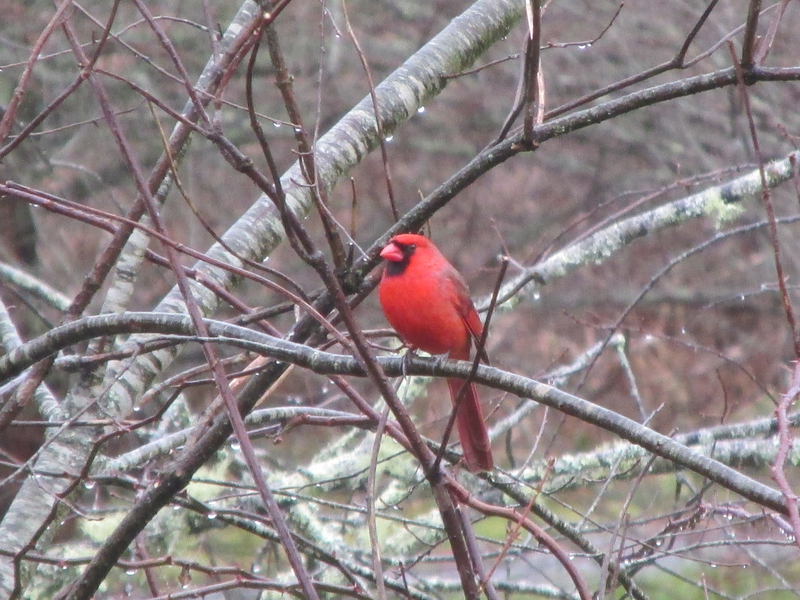 A male Northern cardinal on a gray December day. Female cardinal grasps a perch on a blustery afternoon. This entry was posted in Birding, Birds, Cardinal, Cardinalis cardinalis, Christmas Bird Count, Northern cardinal and tagged Birding, birds, Bristol Herald Courier, Bryan Stevens, Cardinalis cardinalis, Carter County Compass, Elizabethton Star, Erwin Record, Feathered Friends, Friends of Roan Mountain, McDowell News, Our Fine Feathered Friends, The Erwin Record, Winter birds on December 20, 2015 by Bryan Stevens.